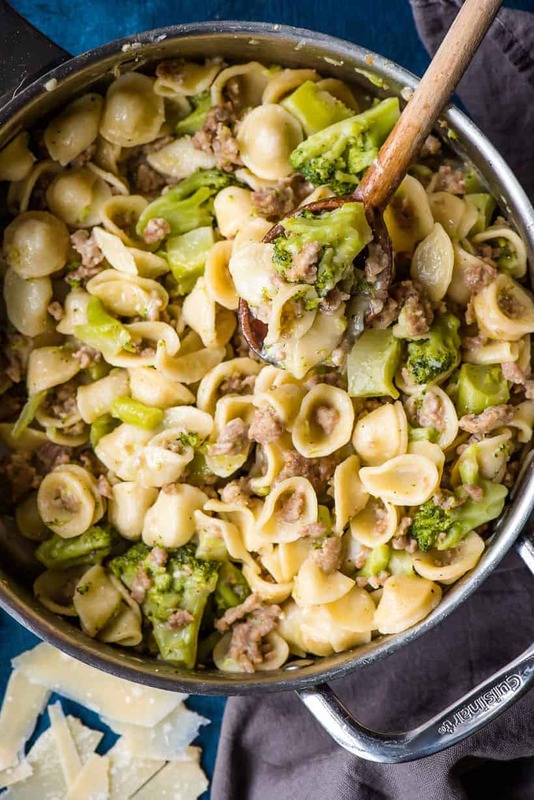 You’ll want to save this One Pot Orecchiette with Sausage and Broccoli for busy weeknights! Last week my son asked me if the baby was about to “bust out” of me. I’m pretty sure he thinks I’m growing a dinosaur who could punch his baby dino talon out of my tummy at any moment. I wouldn’t call the I’d prefer my son pick slightly less…ahem…violent terminology, it seems we’re all growing more aware of baby number two’s fast approaching arrival. That whole “second child problem” thing? It’s more real than I ever thought possible. While we spent months and months preparing for my first son’s birth with a carefully themed adventure nursery, multiple baby showers, and plenty of journaling and note taking, we’ve spent the majority of our second child’s pregnancy finishing up a kitchen renovation and trying to make sure our toddler doesn’t break his neck skydiving off the couch. We’re six-ish weeks out, and we just got the nursery painted. There are no blinds or curtains, nothing on the walls, no dresser filled with neatly folded, Baby Dreft scented clothes. He has no name, and his future crib is currently packed full of all the random stuff we had in the guest room-turned-nursery. I guess what I’m trying to say is…we have a lot to do. And also, sorry baby number 2. I promise we really do love you a whole lot. While I had a freezer packed full of Mexican Breakfast Burritos and Honey Apple Oatmeal Muffins before the arrival of number 1, I doubt I’ll be that on top of things this go around. 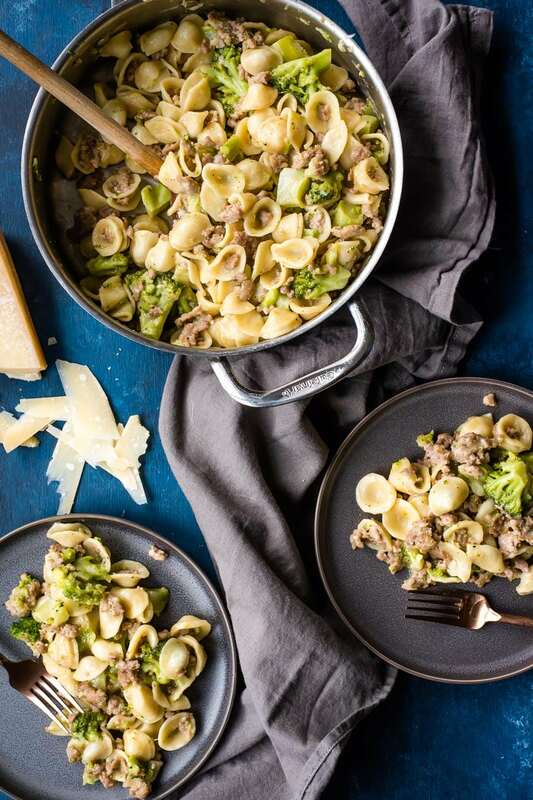 That’s why I’m thankful for super quick one pot meals like this Orecchiette with Sausage and Broccoli. It’s so easy to make, I’m pretty sure I can manage it even with a hangry three year old and a fussy baby strapped to my chest. 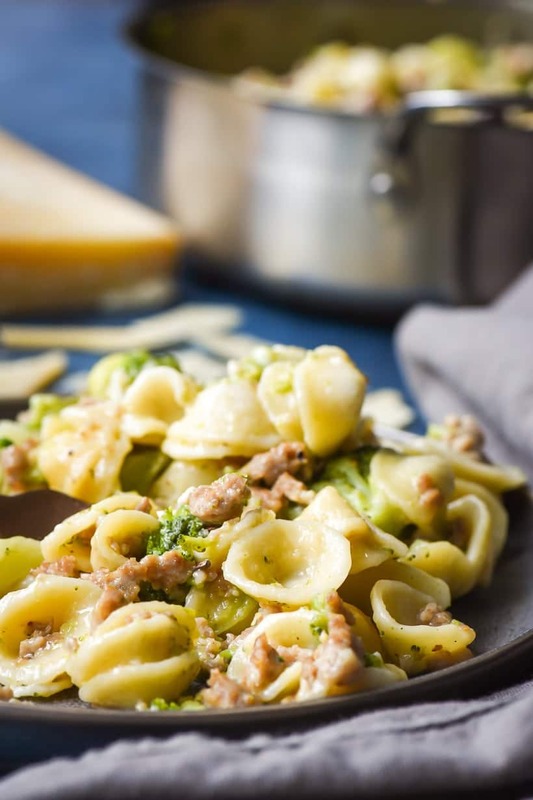 Just like my One Pot Tortellini and Sausage, this recipe calls for the pasta to be cooked in the same pan as all of your other ingredients. I love this method of cooking pasta. 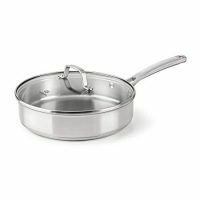 It not only save me time and dishes, but it also helps infuse the pasta with flavor. This super simple recipe starts by browning Italian sausage in a large skillet. Add some garlic (obviously), and a couple of cups of chicken broth. Bring the mixture to a boil, then toss in your pasta. I did find I had to take care to separate the pasta as the little orecchiette shells seem to enjoy nesting together. I boil the pasta for a few minutes before tossing in a bag of frozen broccoli. From there, you can let the mixture boil, maybe giving it a couple stirs, until the pasta is al dente and most of the liquid is soaked up. Top with a little Parmesan cheese and pepper, and voila dinner is D-O-N-E.
Any dinner that I can make in under 30 minutes in a single pan is a win in my book, but it’s a double bonus when my son actually eats the veggies too! Turns out hiding broccoli in a pile of yummy cheesy pasta is a tricky way to get your kiddo to eat more greens. 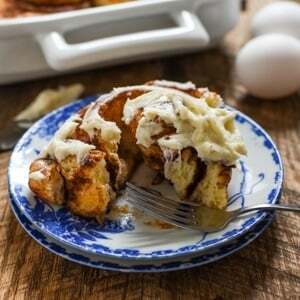 I’m looking forward to experimenting a little more with this recipe. I think hot Italian sausage could be a great substitute for my spice-loving hubby, and other frozen veggies could work equally well. For now, I’m just happy to have at least one trick up my sleeve for baby #2’s arrival! 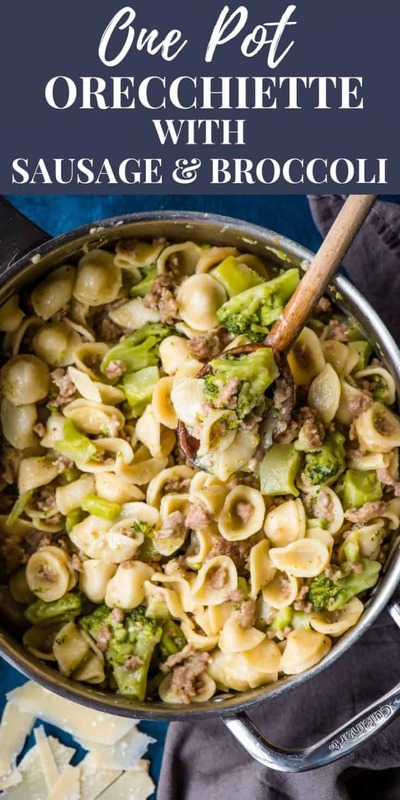 Orecchiette pasta, sausage, broccoli, and Parmesan cheese combine in a single pot to make a family pleasing dinner in under 30 minutes! Heat the oil over medium heat. Add the Italian sausage and cook until browned and cooked through. Add the garlic and heat for about a minute, or until fragrant. 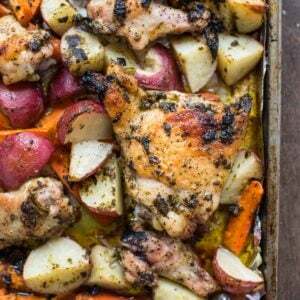 Pour in a small amount of the chicken broth, and use a spatula to deglaze the bottom of the pan. Pour in the remaining chicken broth and bring to a boil. 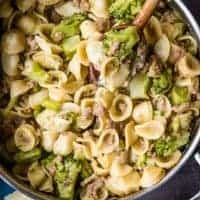 Stir in the orecchiette, breaking apart any pasta that's nesting together. Cover the pot and cook for 3 minutes. Stir in the broccoli. Cover and continue to cook for 8-10 minutes, stirring occasionally, until the pasta is soft and most of the liquid is absorbed. Stir in the Parmesan, allowing it to melt. Season to taste with Kosher salt and fresh ground black pepper. Different varieties of pasta may be used, just make sure to follow the instructions for boiling time for al dente. Replace the sweet Italian sausage with hot Italian sausage if you like heat.